For modern New Yorkers, summer presents a variety of opportunities. Some choose to flee its oppressive heat, inadequately air conditioned offices, and swarms of tourists; while others stay to take advantage of free events, outdoor concerts and movies, and al fresco dining. Summers in New York have not always been as carefree as they are today, however – the return of warm weather used to bring with it the spread of disease. 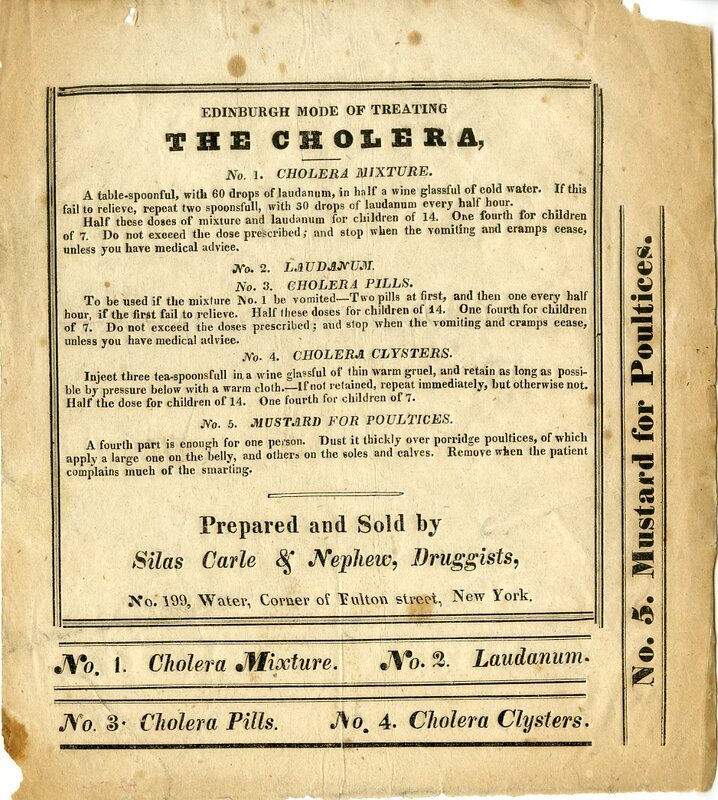 New York City experienced its first serious cholera epidemic during the summer of 1832. The epidemic hit hardest in the City’s poorest neighborhoods, such as Five Points, where residents lived in crowded conditions with little access to clean water. Many of the city’s wealthier residents fled to the country, and the only booming businesses were the ones run by doctors and undertakers. Residents who remained were able to track the spread of the epidemic using the daily “Cholera Health Reporter,” which provided the addresses of infected residences, as well as hospital reports of new cases and total cholera related deaths for the day. Little was known about how the disease spread, and one popular opinion was that cholera was caused by the miasmas that emanated from the streets of crowded neighborhoods. Thus, it was believed that if you got cholera it was your own fault, because you lived in filth. The fear of the unknown led to some interesting medical treatments, including laudanum (morphine), calomel (mercury), mustard poultices, cayenne pepper, and tobacco enemas. 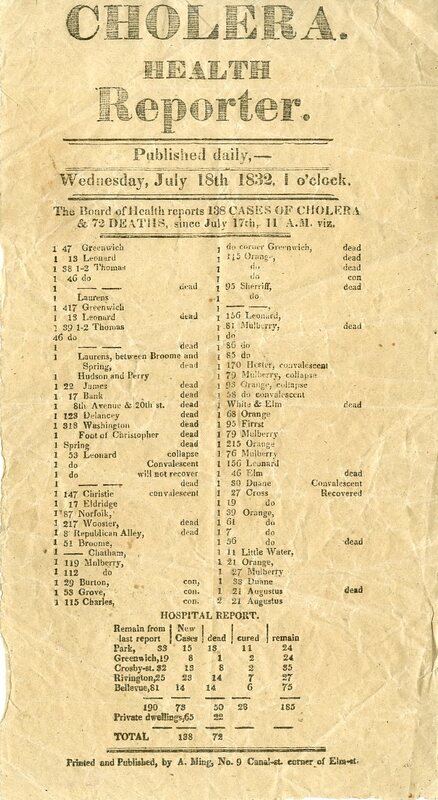 We now know that these treatments, such as the “Edinburgh Mode,” described in the broadside below, likely did more harm than good, and many victims died within a day of being admitted to the hospital. 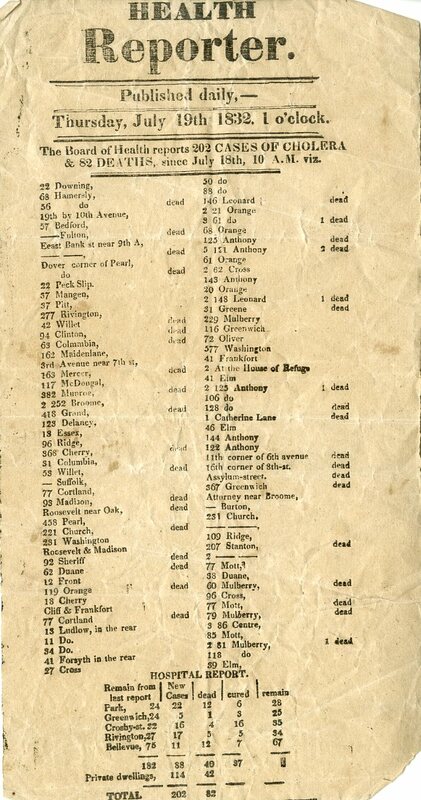 Overall, the 1832 cholera epidemic killed 3,515 New Yorkers out of a population of 250,000 (nearly 1.4% of the population). As a comparison, if the epidemic affected New York today at the same rate, it would claim over 118,000 lives! During the early 20th century each summer brought an increase in cases of polio, so much so that summer was dubbed “polio season.” The City’s worst polio epidemic occurred during the summer of 1916; headlines about the disease shared the front page of the New York Times with news about American troops fighting World War I in France. Approximately 95% of the nearly 9,000 cases of polio that summer were in children younger than 10 years old, which caused parents to panic and the city to impose restrictive measures on children’s activities. 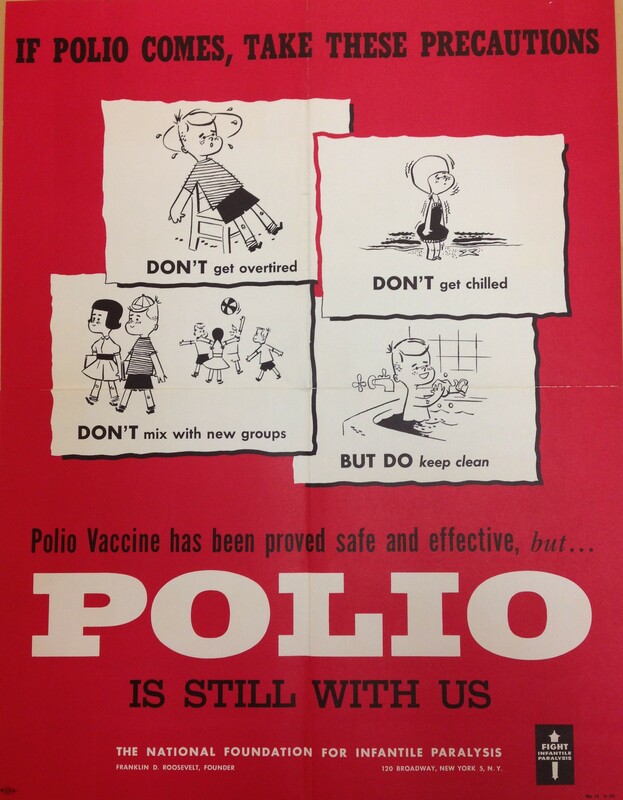 In early July, the city’s Health Commissioner, Dr. Haven Emerson, proposed that the police require every child under the age of 16 to remain at home for two weeks, to help curtail the spread of polio. Fortunately the proposal was not adopted, but children under the age of 16 were banned from movie theaters. Fliers encouraged parents to keep their children from parties, picnics, and outings. The police even revoked fifteen of the 51 licenses it had issued for neighborhood Independence Day celebrations in Brooklyn, where the epidemic was believed to have started among the children of Italian immigrants. National Foundation for Infantile Paralysis poster, undated, in the Collection on Infrastructure. Museum of the City of New York. F2012.18.227. As with the cholera epidemic, little was known about the spread of poliomyelitis, or polio (also referred to as Infantile Paralysis at one time). Children of well-to-do New Yorkers escaped the city with their families, or were sent to live with relatives in order to reduce their chances for exposure to the virus. However, several neighboring communities did not allow families with children to enter. In early July policemen guarded every possible entrance to Hoboken, New Jersey – roads, tunnels and ferries – and turned fleeing families away. Fearing that germs could seep in through windows, some New Yorkers kept their windows shut tight, even plugged with rags, creating sweltering and stagnant conditions. 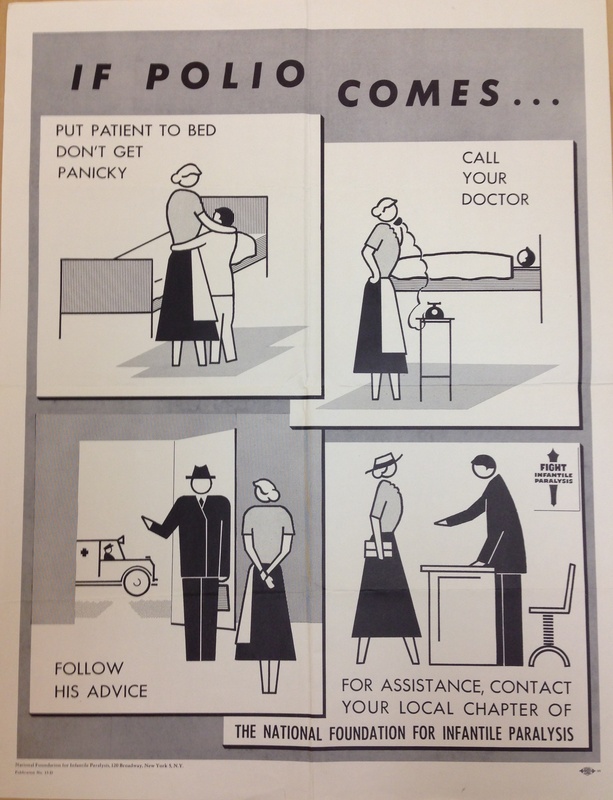 Posters put up by the National Foundation for Infantile Paralysis during the later 1930s epidemics urged parents to keep their children from getting too hot, tired, or chilled – all things that were regular side effects of spending the summer swimming and running around! Children who did become sick were often removed from their homes to a hospital, which made many parents reluctant to report illness. City public schools even opened two weeks late in the fall, out of fear that bringing large numbers of children back together would aggravate the epidemic. National Foundation for Infantile Paralysis poster, undated, in the Collection on Infrastructure. Museum of the City of New York. F2012.18.230. It is safe to say that those who chose to stay in New York during the summers of 1832 and 1916 did not have a great time. Now get over the heat and humidity and go out there and ride a bike around Central Park or walk through Times Square in the middle of the afternoon – it could be worse! To learn more about these materials and other New York City medical services, take a look at the finding aid for the Collection on Infrastructure. This collection was processed, and will soon be available online via the Museum’s online Collections Portal, with funding from the National Endowment for the Humanities. Any views, findings, conclusions, or recommendations expressed in this post do not necessarily represent those of the National Endowment for the Humanities. Magnificent research and explication. Props to you and the MCNY blog! This entry was posted on August 4, 2015 by EmilyC in Manuscripts and Ephemera and tagged 1930s, 19th century, Children, Cholera, Disease, Epidemics, National Endowment for the Humanities, Polio, Poverty, Summer. 19th century 1700s 1800s 1880s 1900s 1920s 1930s 1940s 1950s 1960s Actors archaeology Broadway Bronx Brooklyn Byron Company Central Park Children Collections conservation digitization Ephemera Fashion Greenwich Village Harlem Historical Preservation Holidays Landmarks Preservation Commission LOOK Magazine Manhattan Midtown Manhattan Musicals National Endowment for the Humanities Negatives New York City photographs Photography Plays Portraits postcards Queens Revues Stanley Kubrick Tammany Hall Theater Times Square William Shakespeare women World's Fair Wurts Bros.